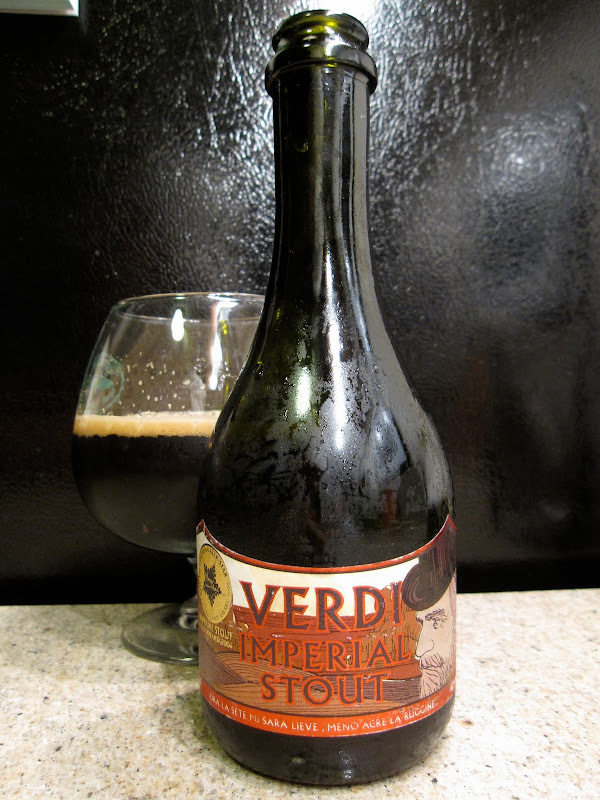 Italians Make Craft Beer Too! And damn good craft beer, at that. This here is Verdi Imperial Stout from Birrificio Del Ducato, purchased at the spectacularly stocked Super Buy Rite in Jersey City, NJ. 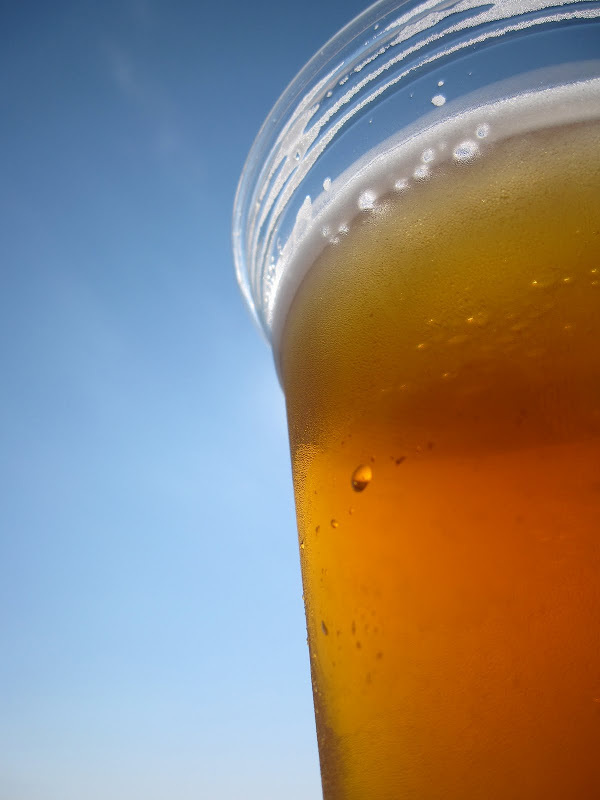 I've been meaning to get around to trying an Italian Craft Beer, spurred by the fact that Sam Calagione's Eataly rooftop brewpub will be opening in Manhattan in a few months. Here's the thing. It's good. It's very good. Its dark and roasty with hints of coffee. The back end even has a spicy chili factor. Its got basically everything I'd want in a stout. BUT, I paid roughly $10 for this 330ml (less than 12oz) bottle. So... its hard not to think about how I could be buying a comparable beer made by an American brewer for much less. Therein lies the question. Is it worth it to buy imported craft beers from Italy at a higher price when we already have a delicious lineup here in the States for significantly cheaper? I honestly don't know. There are brews from abroad like Mikkeller and BrewDog that I love and would pay for, but a lot of those come in 22oz bottles that makes me feel alright with paying a bit more. What do you think? This past Friday, I made the journey down to Delaware to visit the Dogfish Head Brewery in Milton, DE and their brewpub in Rehoboth Beach, DE. This was my second time visiting the production brewery, but the first since their recent face-lift. To get down there, my friend Jeff and I took the Cape May-Lewes Ferry, which required us to get up at 6:30am. Ouch. But relaxing with a 9am Dogfish Head 60 Minute IPA on the boat was more than enough of a reward for being up so early (insert 5 o'clock somewhere joke here). Plus, it was a beautiful day. 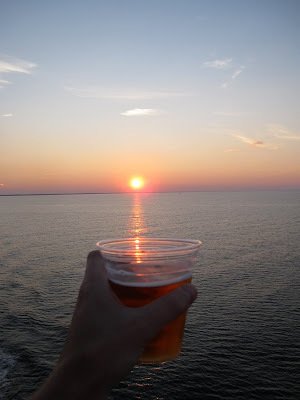 This awesome backdrop of the sun-soaked Delaware Bay was too much awesome to not take advantage of and thus, a photo shoot with the 60 Minute inevitably ensued..
One other ferry passenger took notice of all of the photos I was snapping of the beer and remarked "must be one helluva beer!" I confirmed that it was and noticed that there were a lot of people imbibing at that early hour, yet we were the only people drinking Dogfish. That would remain the case on the ferry ride home later that night as well. Shame. After safely landing in Lewes, DE, we hit the road on our way to make our booking for the 11am brewery tour. After snarling along Route 1 (summer traffic in DE is rough) we managed to park at the brewery a few minutes after 11, run in and join the tour already in progress. Our main motivation for another trip was to see what they had done to the exterior of the building; the new tasting room and the new huge fermenters installed outside. Above you see the grist mill on the right and kettles at the back wall. Not much had changed here. There were also Johnny Cask 75 Minute IPA firkins awaiting filling as well. Oak tank! The fermentation room also looked pretty much the same from the last visit. Oak tank and Palo Santo Tank on the left, 400 barrel fermenters on the right. By far the most obvious change was in their entrance and tasting room/gift shop. It used to be so that you'd walk directly into the tasting room which felt much like a sectioned-off part of the brewery. Now you walk in and there's a waiting area along with a receptionist desk with a doorway to the tasting room to your left. Definitely a much nicer layout. We also caught a glimpse of the camera crews for the new Discovery Channel show based around owner Sam Calagione. The room is centered around the tasting bar which that day was pouring My Antonia, Raison D'Etre, Sah'Tea and Palo Santo Marron. You can also see they have plenty of beer to go, so we picked up some My Antonia, Wrath of Pecant (what's the deal with the T? )* and Dogfish's version of the Saison Du Buff. *UPDATE: Thanks to Mariah Calagione on Twitter for the explanation on why its "Pecant", check it out here! Here you can see the new fermenters and what seems to be plenty space for further expansion. Not to mention the newly re-poured Bocci Ball courts. Then there's the newest installment, a steampunk style treehouse! Very cool. It was closed, but we fantasized that there was a tap line running up at the top. From there we ventured to the brewpub in Rehoboth and had a fantastic meal paired with some delicious DFH beers. We had the Zeno and Portamarillo, both brewpub exclusives, and the cask 75 Minute IPA, which is (shockingly) a blend of the 90 and 60 Minutes. A 60 Minute on the ferry ride back while watching the sun set brought us full circle, and was the best way to bid adieu to Delaware.